I have had all these ideas in my head about building a dessert around a classic bread pudding made with a fluffy brioche, adding pumpkin puree for that seasonal flavor, plenty of spices to complement the tame pumpkin, a creme caramel-type base for added stickiness, and rum-soaked raisins thrown in just because. Sound good? It was! While the bread pudding baked, the smells coming from the oven that perfumed the whole house were absolutely amazing--forget scented candles. If my windows had been opened we would have had people lining up outside the front door. Roasted pumpkin, freshly ground spices and Jamaican rum all contributed to having our home smell better than any Thanksgiving dinner you have ever sat down to enjoy. Hmmm..., comfort food seems to be in the spotlight on Under the High Chair these days. With rice pudding a few days ago and a bread pudding today, what's next? Pease pudding? 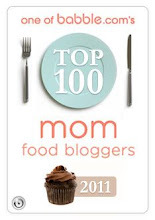 I think I'll leave that one up to the British - like Amanda at Little Foodies who makes her pease pudding with ham. Delicious! Preheat oven to 350 degrees. Butter six 10-ounce ramekins or custard cups. In a small, heavy bottomed pot, carefully dissolve 1/2 cup sugar and cook until golden, stirring occasionally. Divide evenly among ramekins to coat the bottom and allow to cool. 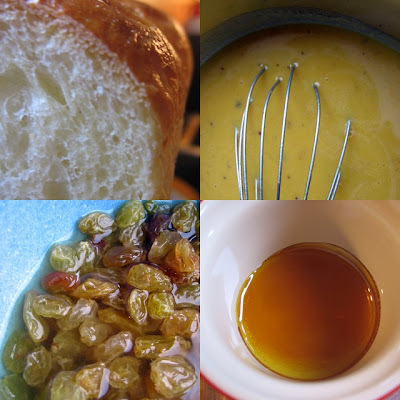 Place raisins in a small bowl, and cover with rum and the hot water; let soak until plump, about 20 minutes. Drain; set aside. Combine cinnamon stick, whole allspice and tonka bean in a spice grinder and grind until fine. In a large bowl, whisk together pumpkin, eggs, granulated sugar, milk, ginger, vanilla, spice mix, and salt. Toss in the bread cubes, and stir gently to evenly coat; let stand a few minutes. Fold in the raisins. Divide among prepared dishes, pressing down slightly to make level. Bake until custard is set in the center and top is golden, about 40 minutes. If bread browns too quickly, cover loosely with aluminum foil. Remove from oven and run a sharp knife around the edges; let cool slightly. To serve, un-mold onto plates; serve with sweetened whipped cream. It is entirely up to you if you wish to spike the cream or not! Now that have I moved into the second trimester of this pregnancy, I can feel my energy creeping back. It feels good--maybe a little too good. Uh oh, do I really have this many things on the go? As we speed toward the holidays and with the impending baby arriving soon after, it’s as if a fire has been lit under us to get some of the house projects wrapped up—I mean, started--which, as anyone who knows us can testify, means renovations. So, let’s see. There is wall paper to strip, closets to build, flooring to lay and painting all around. I’ve also taken on a small, weekly catering contract that helps keep me even busier in the kitchen. All this on top of our usual active schedule makes for some long days. I like to work, I really do, I don’t really know how to not be busy, but when my doctor is telling me I have low blood pressure and to slow down, I realize I have to try and not do quite so much. That brings us to our recipe for tonight’s dinner. It involves a shortcut. Although I am not one t o regularly open a can of soup or bake from a mix, I am not opposed to simplifying recipes or eliminating steps such as this one. I have used dumpling skins on occasion to make ravioli or tortellini and find that they are a superb alternative to the time-consuming homemade pasta dough. I would love to haul out my pasta machine in the afternoon and spend an hour or so playing with dough, but I don't always have the time or energy. Although the taste of fresh pasta is hard to beat, these dumpling skins at least provide great texture and look pretty good too! Pumpkin recipes are popping up all over the place and so I'll add my two cents with this ravioli recipe. 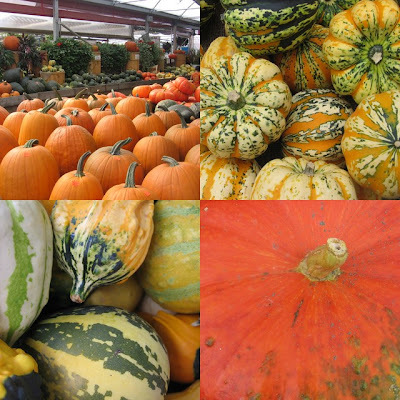 The squashes are particularly beautiful this fall and if you live anywhere near a market, you should get out and enjoy the colours. The bitter rapini is a perfect contrast to the rich filling of the ravioli and the pine nuts provide a needed crunch. Of course, no pasta is complete without some shavings of Parmesan! This is a quick supper to put together. Have your partner toss a salad and let the kids grate the Parmesan. You can fill the ravioli while your water is coming to a boil and before you know it, dinner is on the table. In a small pan, melt butter and cook gently until it browns lightly. Set aside. Trim rapini, removing tough stalks and keeping the heads. Blanch or sauté lightly, season ,and reserve for dish. Prepare filling by combining pumpkin puree, Parmesan, egg yolk and seasoning. Have a small dish of water on hand. Place about a tablespoon of filling in the center of a dumpling skin. Dip your finger in the dish of water and run your finger around the edge of the skin to moisten. Top with another skin and press firmly around edges. Repeat with remaining filling and dumpling skins. Drop into rapidly boiling water and boil for two minutes. Drain and toss with brown butter and warm rapini. Transfer to a serving dish, sprinkle with pine nuts and parmesan. Serve at once. Labels: Pasta, Playing with Pumpkin, What's For Dinner? In the 'Travel' folder of my favorite bookmarks, I have the Rice to Riches website linked. To me, travel consists mostly of eating, so it shouldn't surprise anyone that the folder doesn't contain many hotels, cheap flight deals, or online translation helps, but just a slew of restaurant links, bakery websites and promos for a few dream wine vacations (someday). I meant to get to the rice pudding mecca when I was in New York the last time, but it didn't happen. Well, that's not totally true, I did get there--I walked in and then back out. I love rice pudding, hot or cold, and I had heard enough buzz from friends about Rice to Riches, that I knew I was going to have to get down to Little Italy and taste for myself; however, when I got there I couldn't bring myself to order. Maybe I should blame the large Lombardi's pizza we had just scarfed down. Perhaps the Katz's pastrami on rye, enjoyed only an hour before the pizza, wasn't quite laid to rest, or I was still experiencing cramping from those oh-so-heavy Upper West Side bagels. Whatever it was, at that moment , standing in the ultra-modern, one-and-only Rice to Riches, surrounded by people hunched over orange plastic bowls, I knew that it would have to be enjoyed the next time I was in town. Still, I'm not totally convinced though. To me rice pudding should be something simple, not over the top. It should be slightly perfumed, maybe jazzed up with a handful of currants or toasted coconut. You know, satisfying and straightforward. 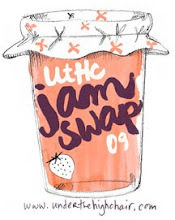 Does Cookies and Cream Rice Pudding with Toasted Buttery Pound Cake sound like this to you? See for yourself; check out the Rice to Riches menu for more wild flavors such as Rum 'n Raisin, Rocky Road and Pecan Pie. It's like they swapped menus with Baskin Robbins or something. Even now, while battling a serious case of the late-night munchies, these choices don't sound particularly appealing. I'll tell you what does do it for me in the rice pudding department. A little recipe for traditional Persian rice pudding, delicately flavored with the aromatic rose water and cardamom, adapted from the superb Seductions of Rice by the talented Jeffery Alford & Naomi Duguid. I enjoyed this dessert so much I am wondering if I need ever head south for the Big Apple's famed rice pudding hot spot. Oh well, I hear they ship. (How appetizing does that sound?) But trust me, simmer a pot of this rose water and cardamom rice pudding on your stove for a few hours and you will never need to leave home. Satisfying and straightforward, simple and seductive. Wash the rice thoroughly. Combine in a large heavy saucepan with the milk and water and bring to a boil. Lower the heat to very low and simmer, stirring occasionally to prevent sticking, for 2 hours, or until most of the liquid has been absorbed; the texture should be slightly soupy. Stir in the sugar, the rose water and cardamom and cook, stirring, for another five minutes. Taste and stir in more sugar if you want. Transfer to a serving dish and let cool to room temperature. If you wish, just before serving drizzle a little honey over the pudding and garnish with chopped pistachios. We were married in an apple orchard, Danny and I. It was spring and the sun shone, the grass was tall and the apple blossoms were budding a light pink. I had always dreamt of getting married outside and Quebec's sprawling apple orchards provided the perfect backdrop when the time came. We are fortunate enough to live close enough to that same orchard so we can visit it a few times a year. Usually we plan this around two seasons: in the spring when the blossoms are in full bridal splendor, and in the fall to gather the harvest. 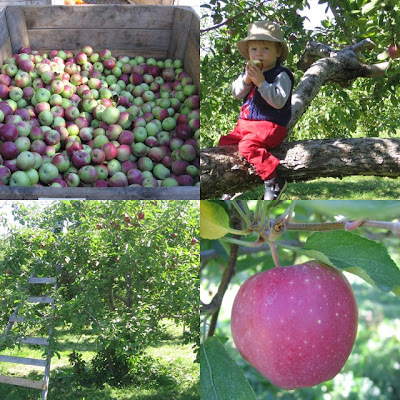 This autumn we brought Noah, who picked apples for the first time. He was oblivious to the history of the orchard, but ran around happily with a partially eaten apple permanently clutched in his little hand. We gathered as many apples as out bag would hold and then sat to eat a few and enjoy the beautiful day. This year I vowed to do something different with my apples other than pies and caramel apples-a personal favorite. Although I had stocked up on enough candy apple sticks to last me a lifetime (or at least the lifetime of my teeth) it was time to make some butter, just like my mother used to make for us kids. A normal Sunday morning in winter would become unexpectedly extraordinary when she opened a jar of apple butter to have with our homemade toast. This recipe is a combination of about three different ones, yet turned out great. The majority of the work is passing the pulp through a sieve to get the tasty puree. It is well worth the work and we now have a shelf in our pantry stocked with this luscious spread to enjoy during the coming cold months. Wash, quarter and remove both stem and blossom ends from apples. Combine apples, apple cider and cinnamon sticks in large, deep stainless steel sauce pan. Simmer, covered, until apples are soft, about 25 minutes. Remove cinnamon sticks and reserve. Crush apples with potato masher. Put mixture through sieve or strainer to remove peels and seeds. Measure out 6 cups of applesauce, set aside. Measure maple syrup; set aside. Return apple puree (and, if you want, cinnamon stick for a more potent cinnamon flavor) to a clean large stainless steel saucepan and stirring occasionally, bring to a boil. Reduce heat and boil gently for 30 minutes or until apple spread mounds on a spoon or desired thickness is reached. Add maple syrup and cook gently another 30 minutes, stirring often. Now at this point I chose to throw caution to the wind and abandon traditional canning directions in favor of a time-saving technique I got from a friend. It worked for me, so here's what I did. Place 7- 250 ml mason jars in your dishwasher and run through a hot rinse cycle. Set screw bands aside and place lids of jars in a small pot. Bring to a low simmer. Have ready a sterilized ladle, tongs, funnel and a clean dish towel for moving jars. When apple mixture has reached desired consistency, remove from heat. Working with one jar at a time, remove hot jar from dishwasher and using a funnel and a ladle, fill jars with apple butter. Remove a hot lid from the water with your tongs, place on the jar and screw on the screw band to finger tight. Place on a clean towel on your counter and DO NOT TOUCH for 24 hours. (Tip: make sure you husband knows to stay the heck away from them too, or you’ll have issues like I did.) Repeat with remaining jars until apple butter is finished. Jars will seal on their own. After 24 hours test for seal. Sealed lids curve downward and do not move when pressed. If any have not sealed, place in refrigerator for immediate use. Some of you may be aware that Thanksgiving is just around the corner. Canadian Thanksgiving, that is, as we celebrate it a month earlier than the USA. There is always so much to be thankful for and this year is no exception…health, family and friends, a baby on the way, and of course, great food! This year I am not doing my own grandiose dinner, but rather collaborating on two different events-one with family and one with friends. However in most Canadian homes you will find menus that center around a roast turkey, cranberry sauce, probably a stuffing, mashed potatoes, autumn vegetables…and-most importantly-PIES! Early on in my childhood years, my parents realized that I had a passion for food and cooking. I mean how else can you explain the gift of a beautiful pie cookbook for my 11th birthday from them? I spent many a happy hour rolling pie dough and trying new fillings, some of them successful, and some of them failures. Perhaps it was all that early practice that sparked my love of pies and so for me, Thanksgiving is largely about these special, fruity tarts. So this pie is showcasing these fall fruits fresh from my garden and the flavors did not disappoint. I love a tart pie! For the top I had a bit of fun and cut little baby turkeys out of the dough with a cookie cutter and partially covered the filling. They looked a little less recognizable when they came of of the oven, but tasted yummy anyway! Roll out bottom pie crush and mold into pan. Chill 20 minutes. Beat egg yolk and cream together, set aside. Toss rhubarb, sugar, cornstarch, and salt together until well coated. Gently add raspberries to mixture. Heap up into chilled pie shell and dot with butter. Roll out top pie crust and make desired designs with it (lattice, etc). Cover pie filling with the pot crust, crimp edges and brush with egg mixture. 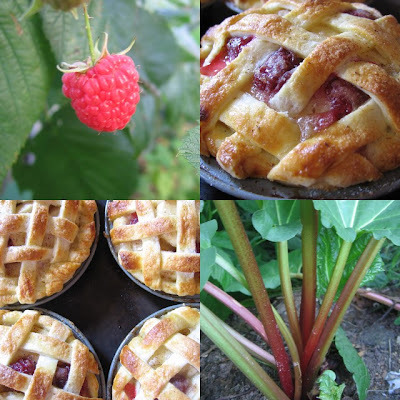 Bake until crust is golden brown and juices run from the rhubarb. Cool at room temperature. Chill before serving. Lovely with vanilla ice cream! The Complete Book of Pastry by Bernard Clayton, JR. is a battered, dog-eared, stained cookbook that I took with me from home when I left. My dad gave it to my mother back in 1985, so the inscription dates, but it was more my sisters and I who delved into it and began baking our own sweet and savory delicacies at a very young age. I have an attachment to this cookbook, not just because of all the great recipes it holds, but because of all those memories between its pages. Recipes such as Quiche Lorraine, Croissants, Apple Strudel and Classic Puff Paste are penciled-over, ripped, and well-used. My dad certainly benefited from this purchase, but then he generally did for every cookbook he brought home! As a young girl, a particular favorite recipe of mine was Eccles Cakes. This particular interpretation of a classic British tea-time treat is more of a Canadian version of the original tea cakes of Eccles, England. Imagine a layer of black currants and sugar pressed between two sheets of puff pastry and baked to a crisp, caramelized delicious morsel. 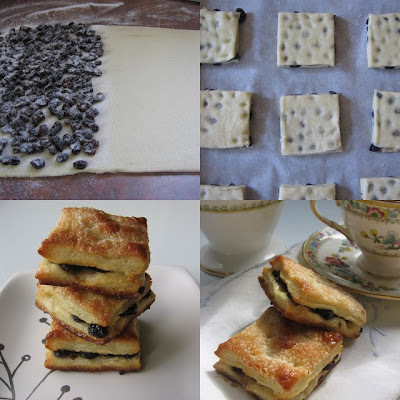 With only three ingredients (once you have bought or made that time-consuming puff pastry) it is fast to make and you can easily whip up a batch for afternoon tea. So put the kettle on. Bernard Clayton credits British Columbian chef, Bert J. Phillips for the recipe. Plump currants in hot water 10 minutes, drain and set aside. Roll chilled dough in a floured surface in to a rectangle 3/16 inch thick. Put aside for a moment while removing all dusting flour. Sprinkle the work surface generously with sugar and continue rolling dough to 1/8 inch thickness. Trim the piece in to a precise rectangle. Cover half the dough solidly with currants in a single layer. Sprinkle lightly with sugar. Fold the remaining half of the dough over the top of the currants. Gently press a rolling pin over the entire surface until the black currants show through the sheet of thin dough. The result is a nice speckled appearance. With a knife or pastry wheel, cut the dough into 2-inch squares and place 12 inch apart on the prepared baking sheet. Place in the refrigerator to relax the dough for 25 minutes while the oven heats. Place cakes on rack to cool. Enjoy!